All right, robots: you've bested our professional wrestlers and our penalty kickers. But as long as San Francisco 49ers kicker Joe Nedney has anything to say about it, field goals belong to the humans. 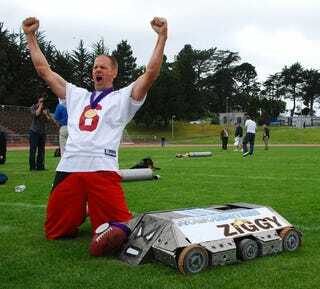 Nedney went kick for kick earlier this week with Ziggy the Combot, a 340 lb entrant in the upcoming RoboGames out in San Mateo, California. And while Ziggy can consistently clear 60 yards under controlled conditions, it fell victim to the same pitfall that's undone so many promising rookies: the pressure a prevailing headwind.